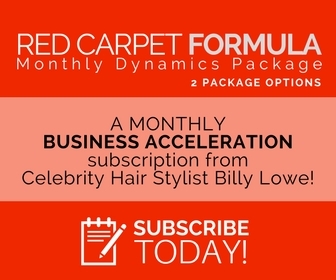 The Red Carpet Formula is a Salon, Spa and Small Business Coaching and Mentoring Package Distributed to clients on the roster to keep them engaged and informed. Developed by Celebrity Hair Stylist Billy Lowe, these practical guides help support business growth and development as well as team building and client retention. Lowe holds a B.A. in Education and has led global health and beauty brands as well as major product launches to great success. In fact, he is the founder and creator of his own line Gloss & Toss Hair Care. Subscribe today to receive weekly Info-Letters from Billy Lowe and his Red Carpet Team and discover ways that you, too, can Roll Out The Red Carpet for Your Salon and Spa Clients. Includes weekly or bi-weekly newsletter from Billy Lowe and team, business roadmaps and exercises, discussion items and small business solutions.